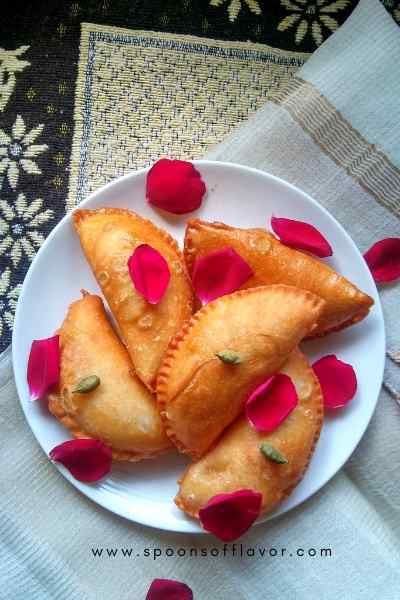 Coconut Mawa Gujiya is a crispy, flaky Indian pastry stuffed with coconut and sweetened mawa/dried whole milk particles. This is usually savored as a snack during Holi and Diwali. 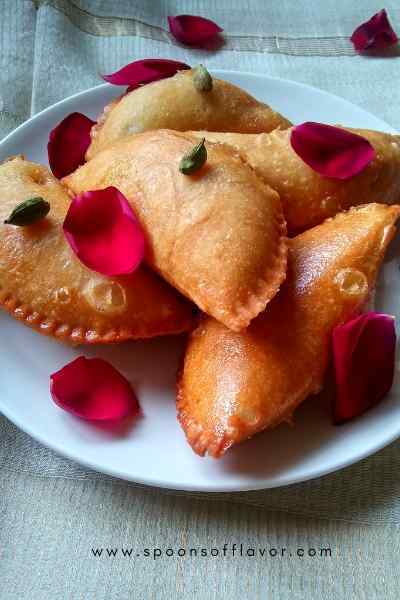 Gujiya is a sweet deep fried dumpling made with all-purpose flour or semolina. Commonly filled with coconut, mawa, dried fruits and a hint of semolina to give the filing a grainy texture. Gujiya is mainly popular in Uttar Pradesh, Rajasthan, and Madhya Pradesh. It is also called as Karanji in Maharashtra and Perukiya in Bihar. The only difference between them is the stuffing. Karanji has the stuffing of coconut, suji, poppy seed. Whereas perukiya has a filling of coconut and suji. However, there are many variations of gujiya are available but the basic is always the same. Coconut mawa gujia are made with maida and filled with sweetened mawa, coconut and dry fruits mixture. Then deep fried in oil followed by dipped in a sugary syrup. The making of the crispy outer structure is almost the same as samosa besides the shape. These are often half-moon shaped and have designed all along the sealed edges. 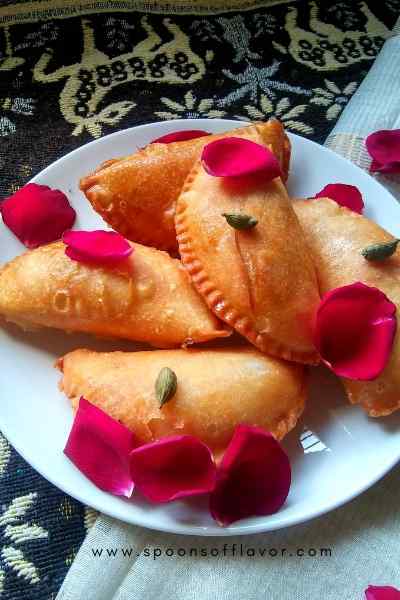 Few tips to get a perfect crispy gujiya. The melted ghee must be in room temperature. The dough should be stiff and smooth. After kneading the dough, it must be left for at least 30 minutes by covering with a wet cotton cloth. Fry the gujiya while the oil is slightly hot and fry for 13-15 minutes over low to medium flame. For a healthy version whole wheat flour can also be used instead of all purpose flour. Even these can be baked instead of deep frying. Here I have used homemade mawa in this and for frying I have used oil. Feel free to use ghee instead of oil if you like. Earlier I have posted Karanji recipe. You can check that. 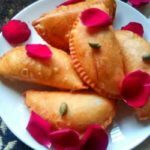 Let me know your thoughts about this coconut mawa gujiya recipe in the comment section. Also, you can connect with me on Instagram, Facebook, Pinterest, and Twitter. 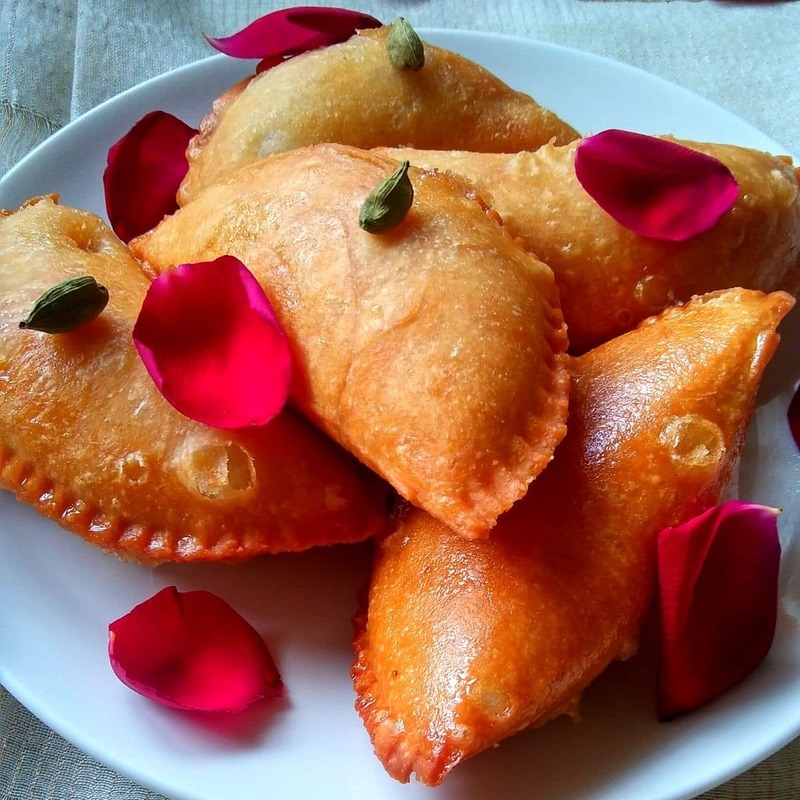 Coconut Mawa Gujiya is a crispy, flaky sweet Indian pastry stuffed with coconut and sweetened mawa/dried whole milk. It is usually savored as a snack during Holi and Diwali. In a mixing bowl, mix maida, ghee, and salt with your hand until you get a bread crumb like structure. Add little by little water and simultaneously knead a stiff dough. Do not over knead the dough. Then rest it for half an hour by covering with a wet cloth. Mix all the filling ingredients together with your hand and set aside. Heat water, sugar and saffron together until one string consistency. Add cardamom powder. Cover and set aside. Knead the dough for a minute and divide it into equal parts and covered with a wet cloth. Take a portion, make a ball. Then roll into a round puri like shape, approximately 3 mm thick. Take 1 and 1/2 tbsp stuffing mixture and place on one side. Wet the edges with water. Flip the other side over it. Then press to seal the edges. Cut off the extra edges or with a fancy cutter or fork or with your hand make a design all along the sealed edges. Once done, cover with the wet cloth and set aside. Make all the gujiyas in the same way. Heat a pan. Add oil. After 5 minutes or until the oil turns slightly hot add 4-5 dumplings at a time. Make sure fry only a few at a time. Do not overcrowd the pan. Fry over low to medium flame for 12-15 minutes. Slowly turn them over in between. Now transfer them to an absorbent paper to get rid of any excess oil. Follow the same process and fry all the gujiyas. Place the fried gujiyas in the sugar syrup, dipped for a minute. Then transfer them to a plate to dry. 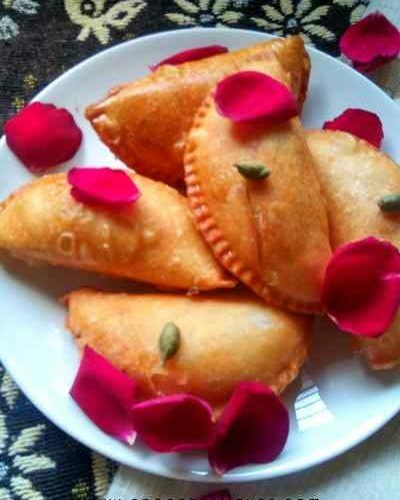 Coconut mawa gujiyas are ready to serve. Serve hot or cold and store the rest in an airtight container. This recipe is also contributed to the FB group ‘Healthy Wellthy Cuisines‘ for the theme Gujiya Delights. Below are the contributions from others for the same. Loved your version of Gujiyas with coconut , mawa and sooji filling.. Beautiful clicks!! Coconut Mawa Gujiyas is everyone’s favorite in my family.